Take your sleep system off the ground with the Goose Creek Deluxe hammock. 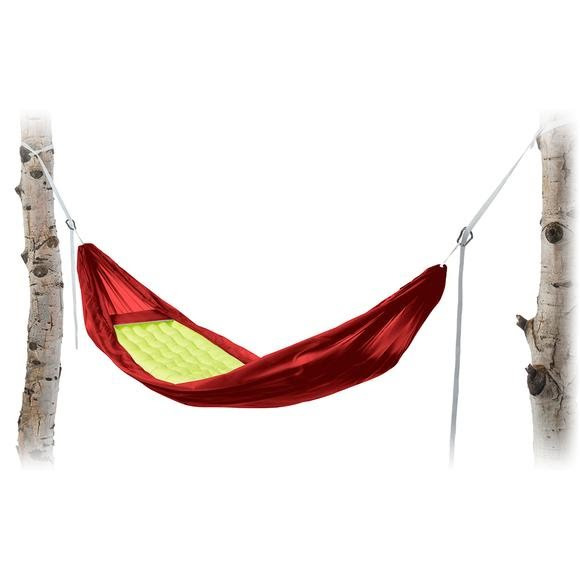 Complete with an integrated pad sleeve, you've never known hammock comfort at this level. Slide your pad in for insulation and adjust the placement to get comfy in a variety of positions including bent knees. Take this hammock on overnights or to enjoy overlooks, hammock life just got a boost from the Mother of Comfort. Take your sleep system off the ground with the Goose Creek Deluxe hammock. Complete with an integrated pad sleeve, you&apos;ve never known hammock comfort at this level. Slide your pad in for insulation and adjust the placement to get comfy in a variety of positions including bent knees. Take this hammock on overnights or to enjoy overlooks, hammock life just got a boost from the Mother of Comfort.